Inspired by the 2013 Milligan accident in the UK, John Barker, a UK businessman did something about the problem. At least in the UK, some boaters, especially those in rougher water want to attach their kill switch lanyard (known as a kill cord in the UK). However sometimes they forget to attach the lanyard. This new invention calls attention to itself if it is not connected. Before you start the boat you must attach the kill cord to the boat. LifeCord uses your existing kill switch. It comes with a variety of connectors so it fits all popular engines. Once attached it begins to flash a light every ten seconds and beep at that same rate. 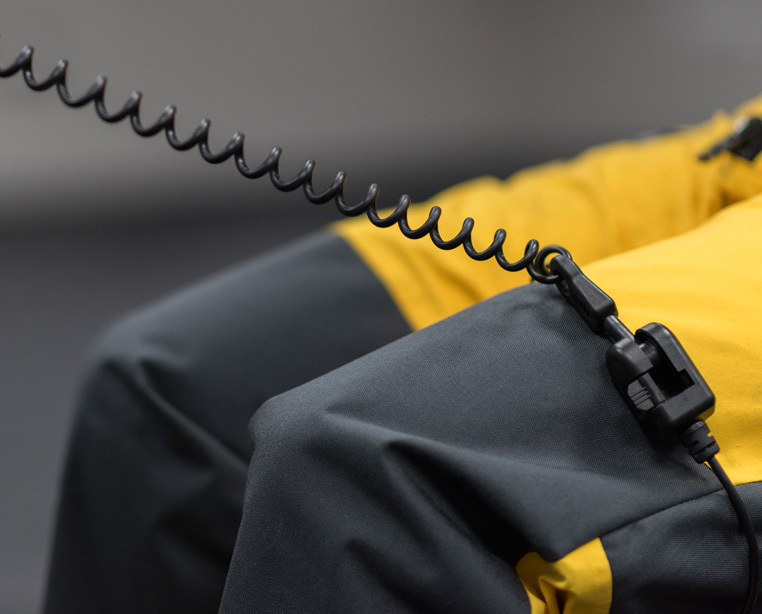 The beeping starts at a low decibel rate and gradually gets louder every 10 seconds until you attach the lanyard by wrapping it around your leg or by attaching it to your life jacket. 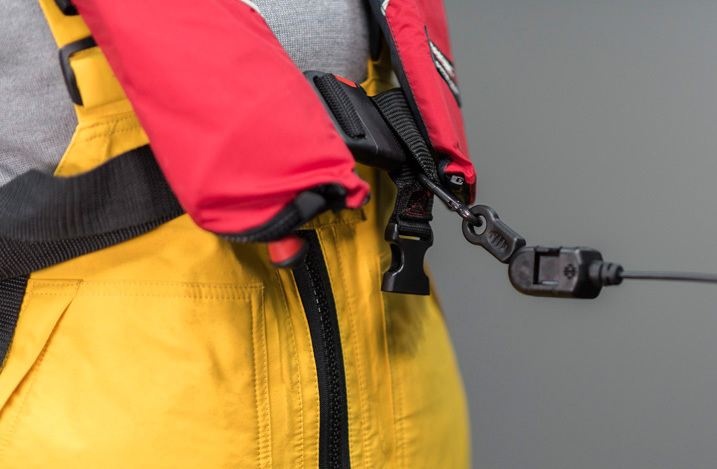 A different end piece is used for your leg that the special snap used for your life jacket. LifeCord is basically a “smart” kill switch lanyard that reminds you to attach it so you do not end up in the “Circle of Death” with an unmanned boat circling, repeatedly striking you with the propeller. If you elect to try to defeat the system by just latching it back to itself in either mode, LifeCord knows you are cheating and will continue to flash and sound the ever louder alarm. By starting out at a light beeping sound, it gives you plenty of time start the engine and check a few things on the vessel and pull the bumpers between you and the dock before the beeping gets loud. LifeCord accomplishes this feat with the parts below. relies on a slight tension in the cord around your thigh to pull apart magnetic parts in the attachment that receives the key (end of what wraps around your leg) and in the key itself. Similarly, but not exactly the same, the key attached to the snap on the lifejacket physically pushes away the magnetic end it attaches to. We looked at this basic problem ourselves back in that era, trying to force boat operators to wear kill switch lanyards if they used a certain lanyard but we did not solve the problem at that time. Congratulations to John Barker and others who did. Among those behind the development of LifeCord were Motor Boat & Yachting, a UK publication. They have an excellent video that shows the system in action. UK boaters predominately wear the cord around their thigh. We saw no specific mention of it, but suspect the same approach works OR could be made to work by US boaters wrapping the cord around their wrist. LifeCords are now being offered for sale by Landau in the UK for about 90 pounds (about $120 U.S.). The battery that flashes the light and powers the beeping lasts about 50 hours of beeping, they suspect enough for a few seasons of boating and can be user replaced. We did not specifically see information on how to retrieve someone if they were ejected. We suspect a traditional lanyard could be kept on boat as a backup, just like is done now. We encourage Landau to publish a video of an ejection (operator just jumps overboard with boat at rest with the cord attached and the engine running in neutral). Show how the engine is shut off automatically, then show anyone left on board should proceed to rescue the person in the water if they were a ways from the boat. NOTE- if anybody tries this they need to make very sure they jump overboard in a manner that does not move the shift-throttle even if the LifeCord is attached. We salute John Barker, Landau, Motor Boat & Yachting, and others involved in the development of LifeCord. 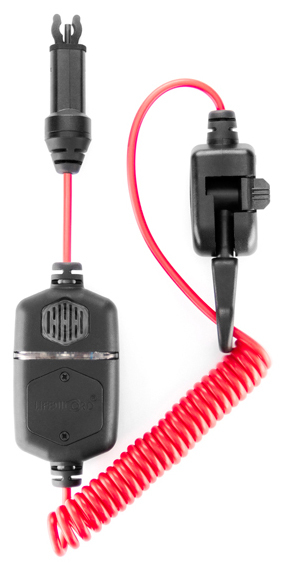 Its great to have a new category in kill switch devices in addition to traditional lanyard and virtual lanyards. Now we have reminding lanyards. We anticipate this product will receive many awards over the coming year and we look forward to it saving lives. We look forward to LifeCord coming to America. Lifecord -the kill cord revolution. Motor Boat and Yachting. Lifecord. Powerboat & RIB. 18 April 2018. Choose Life Motor Boat & Yachting. February 2018. Shows some nice prototype sketches and behind the scenes information.